Employers across many industries and fields expect job seekers to have Microsoft Office skills, and it’s probably the most universally-utilized software in businesses around the globe. You may not need to be an expert in MS Office for your next job, but you'll improve your job prospects and be considered for most roles if you're at least acquainted with the basics. If you’re applying for an administrative position, you'll need to be well-versed in using Office programs for your daily tasks. Most likely, your hiring manager will expect a high level of proficiency. For other jobs, even high-level positions, your employer will expect you to have at least a basic proficiency in Microsoft Word and MS Excel. MS Office includes ten different desktop applications, and the most common are Excel for spreadsheets, Outlook for email, Powerpoint for visual presentations, and Word for desktop publishing. Although your next job might use a number of Microsoft Office applications, many positions require daily use of either, or both, MS Excel, MS Word, and MS PowerPoint. The following descriptions cover skills within these programs that an employer might require, so you can brush up on these as necessary and include them on your resume. Pivot tables: You can manage, sort and analyze data in a number of ways using Excel if you’re able to master the art of the pivot table. Pivot tables do automatic actions like sorting and averaging to help you parse data quickly, using formulas, sorts and other functions that would otherwise take hours, to do a quick analysis. Formula functions: Knowing how to use basic formulas in Excel can help you create spreadsheets that provide real value to your employer. Know the formulas for simple math calculations, and then learn commonly-used skills such as how to link data from one spreadsheet to another, how to find information in large data sets using formulas like VLookup, and how to use the filter and subtotal functions to sort and present data in useful ways. Formatting: There’s no rule that says spreadsheets have to be ugly or boring. Spreadsheets that are formatted using consistent font sizing, brand-specific colors and uniform spacing will be better received by colleagues and bosses. Beyond the basics of making them palatable, Excel provides a host of formatting options you can apply to a spreadsheet to make it more easily readable and aesthetically pleasing. Don’t underestimate the power of a well-placed line divider, or sparingly-applied color scheme. For most written-word communications in business, MS Word is the system of choice. Most employers will seek candidates who can execute the following tasks in MS Word. Formatting & page setup: Many people feel unable to grasp the basics of MS Word's seemingly difficult-to-use formatting and page setup functions. It will greatly benefit you to learn the basics of these functions because they’re core to using MS Office. Formatting can involve things like custom repeating headers, multiple columns, page numbering, and font and color choices. Once you create something you like, you can save the template and reuse it again and again. Using SmartArt & Textboxes: MS Word is great for more than text-based documents. It’s also useful for things like flyers and signage. Word makes it easy once you know how to use these features. Shapes and text boxes can at times be unwieldy, because it's more difficult to get them to overlap, and they can sometimes jump around the page, but once you get the hang of it and understand the quirks, you’ll be a master. If you prefer not to use Photoshop or don’t have access to it, MS Word makes a great alternative to simple visual design projects using images, shapes, colors, and other design elements. PowerPoint is presentation software. It enables the designer to create a wide variety of custom slides for projecting onto a screen. Employers will seek candidates who can put together a presentation in PowerPoint that can include text, pictures, graphics, and spreadsheet tables. PowerPoint has a lot of features, like shadows, sounds, and different slide transitions, and someone adept in PowerPoint will know how to use the right ones for emphasis while not going overboard with too many distracting features. Working With Custom Slides and Templates: Employers want someone who can create an attractive slide from scratch, understanding the basic design elements of composition, color, and balance. A successful candidate will also be able to input new data into an existing template. Animation: Adding animations to text and images adds a layer of excitement to each slide. Animations allow elements on the page to zoom or fade in and out. Employers will prefer candidates who can tastefully and thoughtfully use this feature without going over the top. Working with MS Office can be fun and rewarding. Microsoft Office skills come in handy in just about any role, but especially a workplace environment where administrative tasks will be valued. 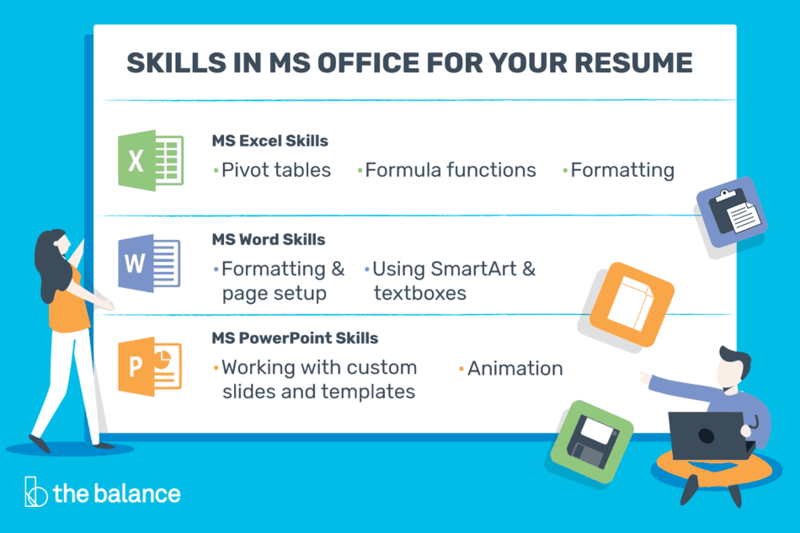 Brush up on your skills, and be prepared to talk about what you can do with MS Office in your next interview. Potential employers most likely won't use all of these. If you have experience using a few of the above programs, you'll probably find it easier to learn any of the others your employer requires, more easily. Use the resume skills below as you create your resume or cover letter, or as you search for a job. During your interview, be prepared to discuss the features you’re familiar with and what you’re able to do. Each job will require different skills and experiences, so make sure you read the job description carefully and focus on the relevant job skills listed by the employer. Resist the urge to include skills on your resume that you don't actually possess. For each skill you include, imagine that you're being interviewed and need to provide an example of a time you used the skill. This exercise will help you be well-prepared for your upcoming job interviews.